It would be kind of embarrassing if aliens from a more advanced civilization showed up tomorrow and found the mess of disease, war, and poverty we still haven't gotten around to cleaning up. Zach Weiner's illustrated short story "The Bachelor" describes humanity's frantic effort to make the planet presentable before our alien houseguests arrive. When the first signal arrived, it was closer than anyone had anticipated. The location and blue-shifting of the transmitter's signal suggested it would be here in months. Months in cosmic time are like seconds in human time. As many predicted, the immediate result was a unified human effort to prepare. However, it was less a grand harmony than a sort of global version of a bachelor scrambling to clean up his apartment before a pretty girl makes a surprise visit. There were many sources of embarrassment that had to be destroyed or hidden. These three problems [from the panel above] were simple. The president of the UN pretended an attractive blond woman was kidnapped and hidden in the ear mound. 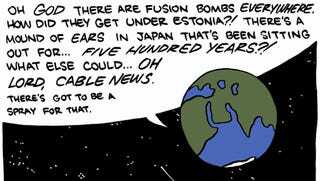 Once the reporters arrived, all the fusion bombs were detonated. But the aliens would also see the social problems - the tent cities, the slums, the favelas. Surely Earth would be more inviting if all those poor people lived in suburban households with a few precious children and a labrador retriever. Read the rest at Saturday Morning Breakfast Cereal. Predictably, it does not go quite as humanity hoped.